As the 2012 MLB season winds down– the Tigers are up three over Chicago with three games to go, all against the Royals– the national focus on Motown thankfully has shifted away from a record that has to be considered a disappointment even if the team makes the playoffs and onto the achievements of Miguel Cabrera, who is well within reach of winning the first Triple Crown since Boston’s Carl Yastrzemski in 1967, and whether those achievements make him a more worthy MVP than Mike Trout. Justin Verlander is, in so many ways, every bit as good as he was last year. He’s striking out the same number of batters, walking just a tick more, and allowing fewer home runs than he did last year. He has given up a few more hits. But he leads the league in strikeouts and innings pitched like last year and you can add in most complete games. It is true that last year he led the league in ERA and he’s second now to David Price … but he again leads the league in ERA+, which takes into account the ballpark where they pitch. Verlander pitches in Detroit, which has evolved into a pretty good hitters park. Price pitches in Tampa Bay, a hitter’s dungeon. The point is that Verlander is basically the same guy he was last year. Only, last year he went 24-5. This year he’s 16-8. And that seems to make all the difference. Last year, he won the Cy Young unanimously and became the first starter to win the MVP since 1986. This year — at least from what I can tell — people hardly seem to be talking about him as a Cy Young candidate. I hear a lot of David Price and Chris Sale and Jered Weaver, and these are all worthy candidates. 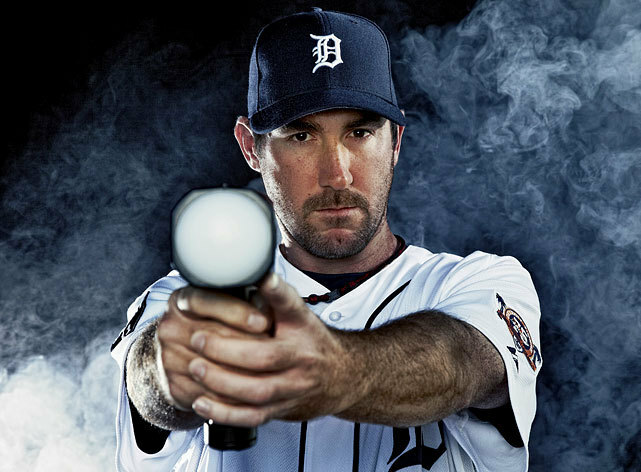 But, once again, I think Verlander has been the best pitcher in the American League. It gets, once more, to the issue of sports narratives. Last year, Verlander was superman. He went into the playoffs last year as this force of nature … and the record will show that in the playoffs (an odd playoffs, admittedly, because of rain) he posted a 5.31 ERA and did not throw a single quality start. But the narrative was so powerful that people STILL kept going on and on about how gutsy Verlander was, how extraordinary, how Koufax-like, how he was almost single-handedly keeping the Tigers alive. This year, the narrative has gone the other way, the narrative has been that Verlander has been, you know, eh, good but not the mega-monster he was last year. The narrative has turned instead into how now Miguel Cabrera is superman carrying the Tigers. Narratives are fun, but they aren’t necessarily true. Verlander really is just about as amazing as he was last year. Finally, looking as far ahead as I’ll allow myself, the Free Press reports that Max Scherzer sounds like he’ll be ready to go for the playoffs, or even this week if necessary. This entry was posted in ALDLAND and tagged carl yastrzemski, detroit, detroit free press, eminem, grantland, joe posnanski, jonah keri, justin verlander, max scherzer, miguel cabrera, mike trout, mlb, sports on earth, tigers, white sox by AD. Bookmark the permalink.